↑ "Department of Tourism". tourism.gov.ph. Archived from the original on 21 March 2018. สืบค้นเมื่อ 1 May 2018. 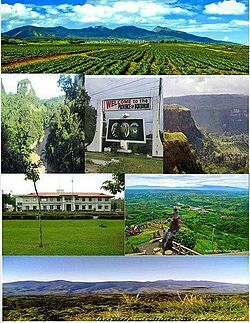 ↑ "Bukidnon Celebrates 100th Year in 2014". Provincial Government of Bukidnon. 2014-03-19. Archived from the original on 2015-09-28. สืบค้นเมื่อ 2015-09-27. ↑ 3.0 3.1 "List of Provinces". PSGC Interactive. Makati City, Philippines: National Statistical Coordination Board. Archived from the original on 21 January 2013. สืบค้นเมื่อ 10 June 2014. ↑ "Mt. Dulang-Dulang (2,938+)". ~ Pinoy Mountaineer. 2007-09-02. Archived from the original on 2012-08-30. สืบค้นเมื่อ 2012-10-27. ↑ "The highest mountains in the Philippines ~ Pinoy Mountaineer". Pinoymountaineer.com. 2008-02-02. Archived from the original on 2012-10-25. สืบค้นเมื่อ 2012-10-27. หน้านี้แก้ไขล่าสุดเมื่อวันที่ 11 พฤษภาคม 2561 เวลา 10:40 น.